The game narrates three months (of spring) of Tsukiko’s life together with her two childhood friends, Suzuya Tohzuki and Kanata Nanami and a half Japanese half French transfer student named Tomoe Yoh who claims to be in love with Tsukiko. And my review starts here. First of all Tsukiko, the main protagonist. She’s a freakin Marry Sue type. 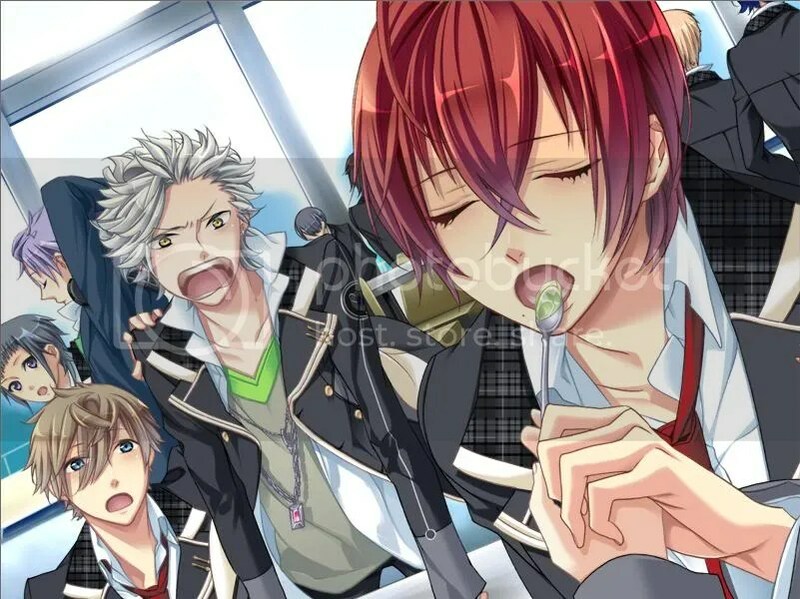 xD In this game, at least, I don’t think I can mention something that was outstanding about her, but sure enough, Starry Sky is also one of those otome games intended for beginners, the story is pretty mainstream and we have the typical otome game trio: the kind, gentle, doting guy, the crybaby tsundere and the transfer student, add in the fact they all happen to be childhood friends. It’s obvious I’d start with him *coughs*forthosewhodontknowNekoisalsoaPisces*Coughs*. I think, in a way, Kanata’s route is the one I liked the most and no I’m not being biased. xDI can only simply call him “adorable”. He’s the ” bag guy but not so bad bad guy” girls always tend to fangirl for, not saying that he’s also tsundere that adds a point to his charm xD Deep down, he’s the most sensitive out of the 3 guys and holds a big passion for photography and beautiful things. Tsukiko’s personality (because she’s a freakin Mary Sue) always differs depending of which boy you want to end up with. In Kanata’s case she practically loved to tease him and getting “EEEEHHHHH? 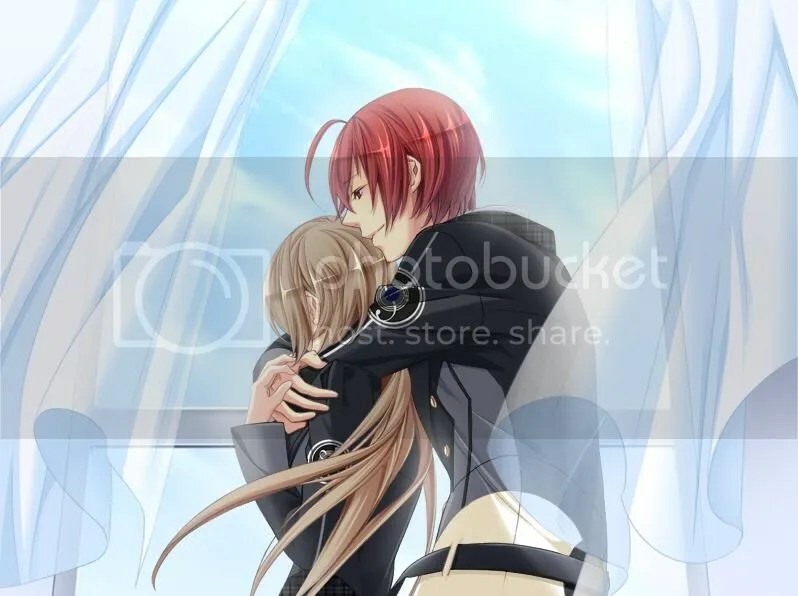 !” moments out of him and this is the reason why I found Kanata’s route the most entertaining. (*coughs*og my sadistic side*coughs*). On the other hand though, it was also very cheesy and dramatical. Maybe I’m a bit cold, but I think sometimes it was too forced. 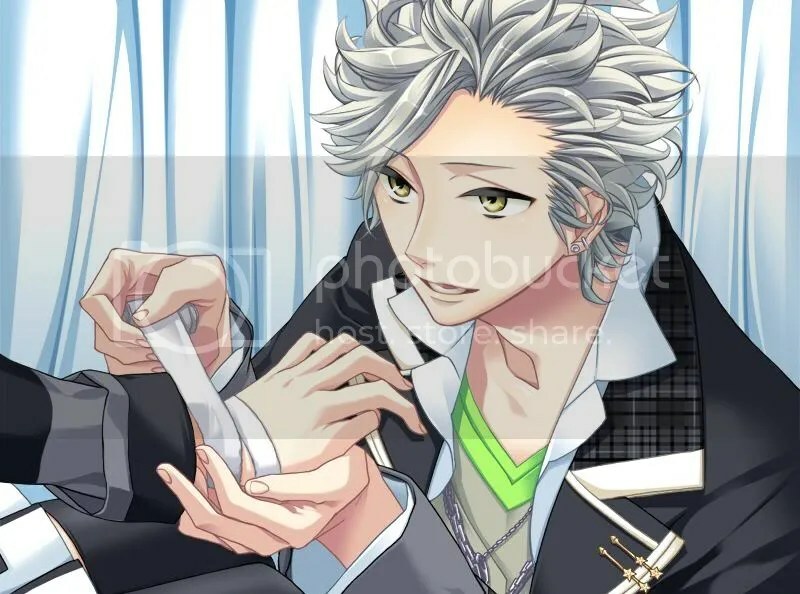 Moving on, I decided to play Suzuya Tohzuki as my second choice and he’s the Cancer of Starry Sky. 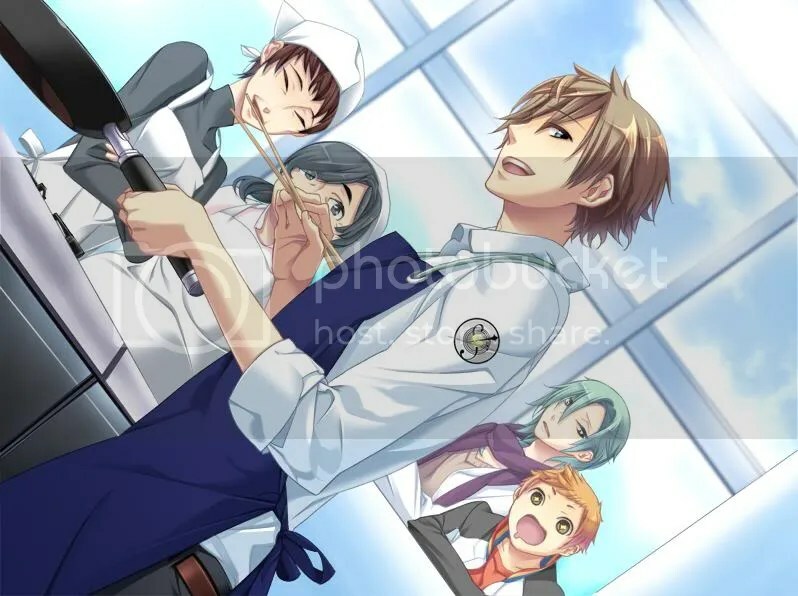 Suzuya’s the always gentle, smiling, good at housework (mostly cooking)..in other words the “perfect” guy everybody would like as a boyfriend, loving and caring towards family. Despite his gentle nature, Suzuya’s smile tends to be also scary and threatening mostly when Kanata and Yoh fight and that’s the best thing about him, that can surely guarantee you a couple of chuckles. Anyway, overall his route was cute but in the end I got slightly bored since there are not many facts to laugh about and the cheesy moments seemed a bit repetitive to me. Mainstreeeaaam. And finally, here’s Yoh. I played him the third since I liked his design the least. I really dunno why the creators made him look like his always high on something…maybe it’s the eyes fault…o well…Overall, I really enjoyed Yoh’s route, more than Suzuya’s. He is more bold than the other 2 and isn’t scared talking his feelings out loud. The funniest part of him is that he has a way with his words, able to make even the worst kind of thugs retreat away in confusion with their tails between their legs. Even though Yoh started as being unsocial and cold towards other people excepting Tsukiko, in the end he warmed up to Suzuya and Kanata too and the friends trio was finally complete! After all, Yoh’s cuteness and weird sense of humor got to me and. His “hime-sama” made me go on a rampage of dokidoki-ness too. Overall I’m pretty surprised but happy it turned out like that. I thought nothing could beat Kanata but I might have been wrong when Yoh came in. 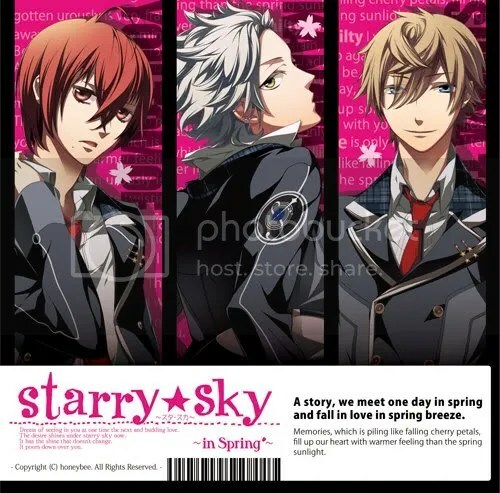 Starry Sky surprised me in the way it made all 3 routes seem canon. This isn’t an easy thing to do, even though, obviously, Yoh was the most canon of the three, in my opinion. The BGMs were all fitting to each situation giving the right atmosphere. The dubbers were also awesome, mostly Daisuke Ono, which I adore. The CGs were also beautiful and well-made. The only thing that I thought it would have been better if included would have been Tsukiko’s voice. She’s voiceless and faceless in the Starry Sky games and it’s a shame since I had a hard time understanding what she was saying! xD Despite what you think, I can’t read kana or hiragana so I had to use ATLAS to translate her lines and it just gave me vague meanings and a lot of headaches…Yes, I played this way before the game got a patch. I give the game a FINE/GOOD score, but I wouldn’t recommend it for somebody looking for a story full of secrets and deep meanings. Starry Sky is pretty mainstream, but if you want something generally light-hearted then go right ahead.